Reassuring all who thought a sequel to Syfy’s flukes-in-a-tornado hit Sharknado might be a creatively empty endeavor, the network has confirmed the return of stars Ian Ziering and Tara Reid necessary to maintain the series’ artistic purity. As reported earlier, then immediately forgotten about in the wake of moving on to other Internet fads, the listlessly Twitter-named Sharknado 2: The Second One will relocate the action to Manhattan, where another freak storm will see the city that hasn’t suffered enough buffeted by shark-filled winds. Ziering and Reid’s Los Angeles-based characters will be there to save the day again, because they’re in town to give a speech at the UN, or whatever, who cares. 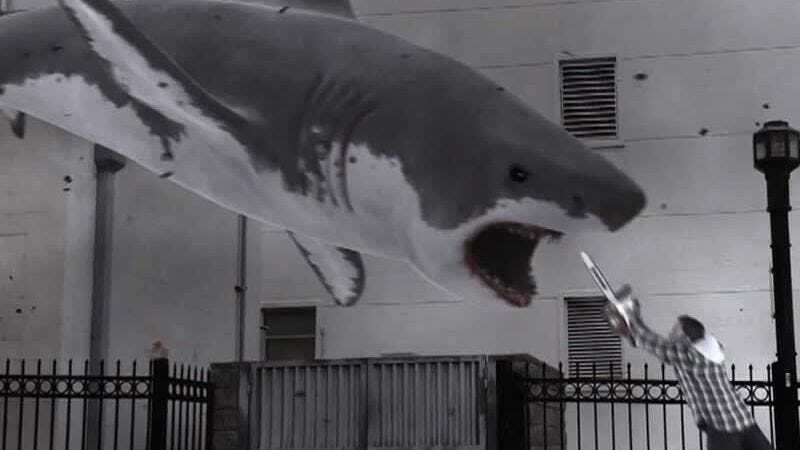 As for whether a Sharknado sequel can recreate its own freak storm of social media attention a second time, it’s certainly something that’s on the minds of its producers at Asylum Entertainment—if not something they’re genuinely thinking about. “Can lightning strike twice?" Asylum COO Paul Barnes asks The Hollywood Reporter, before terrorizing all with his own mash-up metaphor monster. “I don’t know, but it’s a scientific fact that you’re more likely to be killed by lightning than by a shark. This film will have lightning and sharks, so that’s got to count for something.” Ha ha, well, they have fun here.